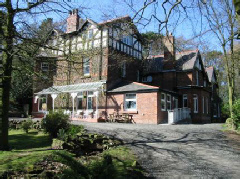 Heathercliffe certainly isn’t the oldest hotel on Nights in the Past (it isn’t even the oldest in the small market town of Frodsham - that accolade belongs to the Old Hall Hotel), but it still has a particularly noteworthy claim to historic fame. A classic Victorian residence, Heathercliffe was formerly the home of John Paul Getty 1st and, latterly, the Queen of Yugoslavia (although which one is difficult to ascertain). Moreover, during its incarnation as a hotel it has welcomed a number of world famous figures including Uma Thurman and George Clooney (not historical, but worthy of mention nonetheless). Frodsham itself is a thriving little place which has long been known for its weekly market that takes place on the broad Main Street. Others will also know of it through its association with Gary Barlow who grew up in the village (and went to school with the author of this very site). The Heathercliffe is well positioned for those looking to visit Chester, while Warrington and Runcorn are within easy reach to the north. The hotel offers a total of nine guest rooms, including a suite named after the aforementioned Queen herself.